that may be unique to the region one lives in. Here's 2 pieces done in the winter over the past few years that show different aspects of light. This is just scratching the surface. Find a horse arena with good views! A soft, misting rain was coming down like a curtain over the hills. The range of color in the green and the violet of certain weeds or shrubs interested me.... this sort of luminous, minty green, and a grey violet. I had to paint that. The foreground horse paraphenalia provided a contrast to the muted bg. I probably overstayed my daughter's time limit on this one. 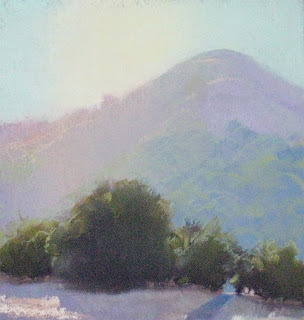 Here is a kind of light that is common in the East Bay hills this time of the year. Often, on sunny days in the winter, there will be a lot of moisture in the air, which will start attenuating values, even within a hundred feet. This effect becomes more pronounced when looking towards the sun, as in this case. This was painted on a ridgeline about a mile from my house, looking down the hill. I was so interested in the blown out light, I don't think I chose the strongest composition here. The 2 tree 'scoops' are awfully similar in scale and angle. The shadowed folds of the hills were showing a strong bounce color from their counterparts, while the upward facing folds turned blue as the sky colored them. It was a warm afternoon, and some kids were flying remote controlled gliders that were whirring about, periodically passing over my head. 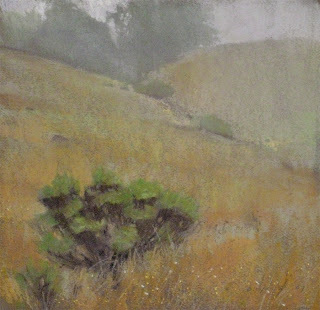 Pastel on Canson paper, ~9 x 16"
This was painted at Sibley Volcanic Preserve, off of Skyline Blvd. in the East Bay Hills about 6 years ago. 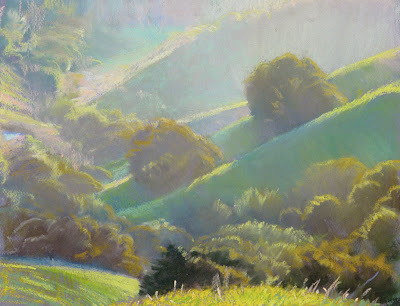 I periodically paint in this area on the way to work in the morning, as the hills are between my house and my workplace. This region is often right on the cusp of the fog, and so it is hit or miss whether you will find sunshine or a cool, grey mist to paint in. In this case, I hiked out to a spot through fog, but by heading East, I managed to get within a few hundred yards of the edge of the fog that was blanketing the entire Bay. I could see the warm sunlight coming in, as it was slowly burning its way through the mist. The valley below, (which is now being turned into a housing development, btw), was receiving warm light, yet I had to look through quite a bit of mist to see it. In addition, there was more low-lying fog in the region beyond. I call these temporal circumstances 'transition zones', when you are between sunlight and fog. It makes for an interesting mix of atmospherics and warm and grey hues to explore. It doesn't last long in one state, but it is always fun to find yourself in such unique lighting. Worth looking for. 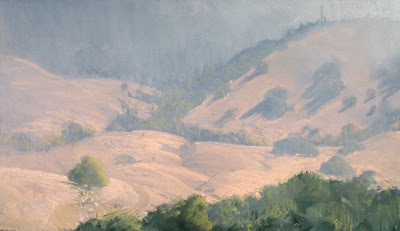 Pastel-wise, I was piling on the pigment, adjusting colors, as the density of the fog shifted, and at the same time, trying to organize the trees and shrubs with actual edges, before everything changed even more. Parts of the image would no longer accept pigment, and there's definitely some bad broccoli in there. That's when it's time to pack up and get to work. Pastel on Canson paper, ~10 x 10.5"
This was painted within a day of the previous image. Same story, different result. I drove up to the park to get out of the fog, but it was up there too. I was with 4 other painters. 2 of us stuck around, and went to work. I walked around on this hillside for awhile, looking at the sillhouettes on the ridge, but then started paying more attention to the subtle color shifts of the vegetation, and the way they helped describe the form of the hill itself. Once you start this kind of image, sunshine is not welcome, as it would radically alter the palette and value range. The fog did lift a bit while I was working, but the light stayed fairly steady. Pastel on Canson paper, 10 x 10.5"
I've been inspired by some great artists that I work with to start this blog. 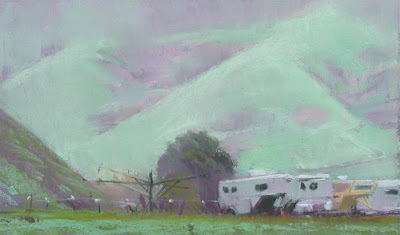 Here's a pastel from last September up in Sonoma. I paint up there every year for the annual SPA plein air show. Here's a link to the event. The artists are guests in people's homes in the county, and paint all week, exhibiting one piece on Friday night for an auction dinner, and then the remainder of their work in the plaza for one day. It is a great event in many respects. All my hosts have been wonderful, generous, and interesting people, I get to spend time around some excellent painters, and painting every day for 5 consecutive days is a great workout. If it was foggy in the morning, I would drive up to Sugar Loaf State Park to get some sunshine to paint in. Sometimes it was still foggy, but on this morning it was quite sunny. The painting is really an impression of the brightness of the morning light, with just simple shapes. The image is a bit noisy, as I shot it with my digital camera on a lo-res setting.